Meeting your demands for Quality, Comfort, Value and Reliability. USA Luxury Tours, owned and operated by Joe L. Alston and Rose M. Alston, is primarily a land travel service that specializes in planning and organizing tours throughout the continental USA and Canada. The company was incorporated in 1993 and has steadily increased the number and quality of its tours and other services since that time. Each year we offer an itinerary of pre-arranged tours throughout the United States and Canada, as well as a cruise every other year. Our customers enjoy traveling to the most desired destinations along with a group of others. The cost of tours includes transportation, lodging and tours to sites of interest. In most cases, breakfast is also included. A tour coordinator who undergoes intensive training before receiving an assignment heads each tour. The motor coach operators are friendly, courteous, and knowledgeable as well as safe and capable at the wheel. Leave the planning and driving to us...just sit back, relax and have fun! You can access a list of our current tours by clicking on the buttons located to the left. If you are part of an organization or group that needs transportation, USA luxury Tours will be happy to give you a quote for chartering a coach. We will also be delighted to help plan your trip. 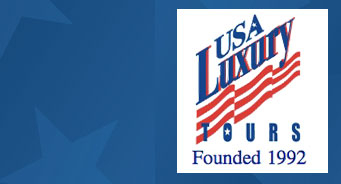 Many churches, schools and other organizations select USA Luxury Tours for their charter coach needs. We acquire only top of the line transportation. Our transportation carriers and drivers have been certified to meet all new standards set by the North Carolina School Charter Transportation and Safety Committee (SCTSC). Also, we are listed as an approved vendor in the purchasing departments of many North Carolina school's, colleges and universities. Visit our Tours pages for the latest information on our Pre-Arranged Tours. You can sign up for a tour by visiting the Sign Up page and completing the form.